The house at 48 Oceanside Drive in Scituate has been destroyed and rebuilt several times. 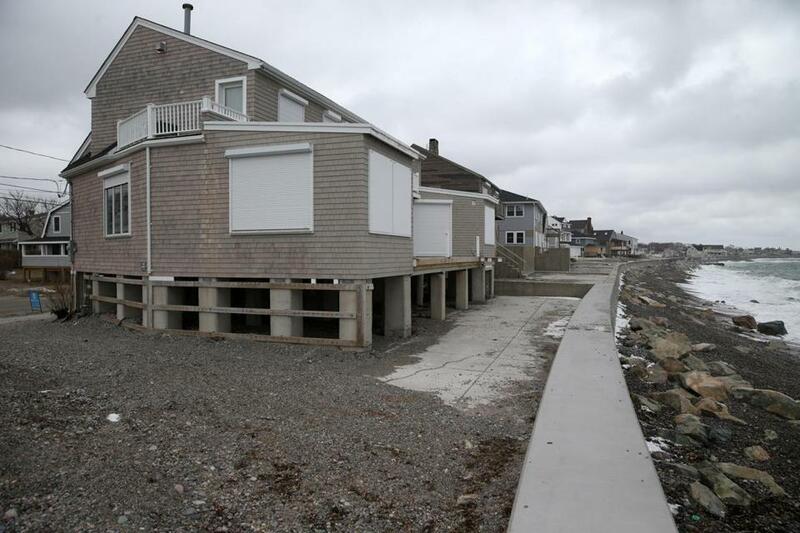 SCITUATE — Over and over again, the Atlantic has taken aim at 48 Oceanside Drive. Almost four decades ago, it slammed the seafront house clear off its foundation. Thirteen years later, ocean water poured through the roof during a nor’easter. So often has the sea catapulted grapefruit-sized rocks through the vacation home’s windows that a former owner installed bulletproof glass. In all, the property has sustained significant flood damage from coastal storms at least nine times. And each time, the federal government helped owners rebuild with National Flood Insurance Program payouts — a sum estimated to total more than three-quarters of a million dollars over the years. Government money helped raise the house on stilts in 2005. Now, the current owner of the $1.2 million vacation house is applying for what construction experts say could be $80,000 or more in taxpayer money to raise the house still higher, hoping to secure it from the thundering surf. The tortured history of 48 Oceanside Drive and the government’s open wallet highlight the central question as Congress debates changes to the flood insurance program: At a time of rising tides and soaring deficits, does the program create incentives for owners to stubbornly keep homes in places the sea inexorably is claiming as its own? “We always knew it was unsustainable there,’’ said Dr. David Cooney, 75, a Maryland oncologist who sold the house after the 1991 Perfect Storm severely damaged it. The saga of the Scituate property is repeated across the United States. There are 534 properties in New England alone that the Federal Emergency Management Agency considers Severe Repetitive Loss properties — meaning in most cases that the flood insurance program has paid the owners for four significant flood claims, two within one decade. Nationally, according to FEMA, there are about 12,000 such properties. Scituate has 112 of them. Over the years, such properties have accounted for 689 losses. The total in claims: $21.3 million. 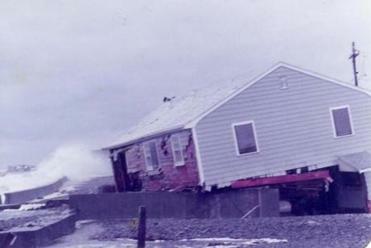 The house at 48 Oceanside Drive took a pounding in the Blizzard of 1978, which knocked it off its foundation. All this occurs without any inquiry into whether the homeowners are wealthy, poor, or in between: FEMA’s flood insurance was designed to help all flood-prone properties regardless of economic status. Homeowners, like those at 48 Oceanside Drive, have every right to take advantage of legal government programs to protect their property. The insurance program, which began in 1968 after private insurers largely abandoned flood insurance because of the recurrent risks, subsidizes some premiums to limit the cost of coverage for owners of older homes that predate current flood plain maps. It was initially designed to pay for itself, but premiums have not kept pace with payouts since a series of punishing storms starting with Hurricane Katrina in 2005. Today, the program is about $24 billion in debt and taxpayers are left to pay the claims. That shortfall is expected to grow in coming years as sea levels rise and storms are projected to become more intense because of climate change. Atlantic waters from north of Boston to Cape Hatteras, N.C., are rising three to four times faster than oceans globally, according to federal scientists. Billions of dollars worth of homes are on the front line. In 2012, Congress voted to phase out premium subsidies for homeowners, boosting their insurance costs to better reflect the true risks of living in flood-prone homes. But even as the law took hold, new federal flood plain maps caused insurance rates to soar for hundreds of thousands of homeowners, many of them in areas where flooding is rare or, historically, not an issue at all. The shock to those unsuspecting property holders created a backlash, with many politicians, including those in New England who initially voted for the new law, supporting its delay or rollback. The Senate is expected to pass a House-approved bill this week that would still raise premiums, but not as steeply as the 2012 law mandated. While premiums for second homes and properties that have been severely and repeatedly hit would experience greater increases, their owners would still be eligible for sizable grants to elevate and fortify homes. And there remains no limit on the number of times a property can sustain damage and its owners collect. In Massachusetts, state Senator Marc Pacheco, a Taunton Democrat, filed a bill in January offering an alternative approach: Create a fund to buy back flood-afflicted properties from willing owners. While there is no funding mechanism yet, Pacheco says he is committed to figuring one out. “There is a lot to be said for not rebuilding in areas,” he said. Harold Cooney, a successful Arlington, Mass., accountant, never learned to swim but always wanted an ocean view. In the mid-1950s, he bought a five-bedroom second home in Scituate for his wife and children, according to David Cooney, one of his sons, and land records. David bought the home after his father died. A year later it was destroyed along with 188 others in town, a casualty of the Blizzard of ’78. Cooney received a federal claim payment although he said he can’t recall the amount. He then built atwo-winged home — he hoped it would be his retirement house — overlooking the Atlantic. He fortified the house with secure shutters and design elements to let water flow freely under it. Still, in 1991 it was badly damaged by towering waves and Cooney came to the conclusion the house was going to be hit again and again. He sold. This picture shows a home at the location around 1988. David Cooney hoped it would be his retirement house. Today, town officials say there are patches of oceanfront in Scituate that should probably never have been developed. There are few natural barriers offshore to slow advancing storm waves, and when those waves come, they slam into sea walls and jettison water — along with boulders — up and onto land, says Richard W. Murray, a Scituate selectman and professor of earth and environment at Boston University. Joseph Pizziferri, 48 Oceanside’s next owner, says he put $155,000 worth of repairs into the damaged house, including steel beams. “I tried everything,’’ he said, but still got flooded three times. Because flood claims are capped and may not cover all repair costs, Pizziferri said he often had to draw on his own funds to fix the damage. Tired of constantly rebuilding, he sold the property in 1999 for $465,000 to Donald F. Craig Jr., a Quincy accountant, and his wife. Craig was initially billed close to $12,000 in flood insurance premiums, but said he was able to almost cut the amount in half because the structure was grandfathered — it had been built to code based on flood maps in effect at the time of construction. Craig also remembers collecting insurance claims two or three times. 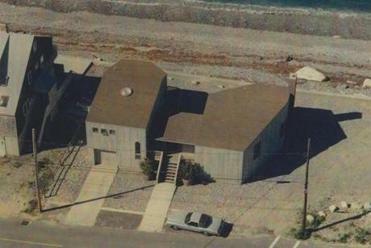 He decided to elevate, expand, and protect the house: He used 2-by-8s in the ocean-facing walls for strength and even installed three-quarter-inch high-impact bulletproof glass. While he paid for the expansion, the federal government chipped in for the elevation: just shy of $40,000, according to government documents obtained by the New England Center for Investigative Reporting. FEMA refuses to disclose the identities of those who have received flood insurance premium subsidies, claim payouts, and grants to protect their homes. The center was able to reconstruct much of the history of 48 Oceanside Drive by combing through town building permits, conservation commission minutes, and town archives and interviewing some of the previous owners and the current one. That reporting shows that total claim and grant payouts for the property over the past 35 years likely exceed $750,000. The amount of flood insurance premium subsidies is unclear because owners said they did not remember or declined to disclose them. Insurance specialists say, however, it is likely that after the 2005 expansion, the home no longer was eligible for any subsidized rate. Economic studies show that every $1 spent to elevate or protect buildings from flooding reduces future losses by $4 or more. But the height Craig lifted the house to — higher than what the federal government and town required — wasn’t enough: Since he sold it to Gary and Margaret Motyl of Florida in 2007 for $1.2 million, it’s been hit twice by storms, most recently in early 2013. That storm caused $160,000 in damage, according to a town building permit application. Margaret Motyl said she is waiting to see whether the federal government will pay to elevate the vacation house again. She said she and her late husband have paid more than $50,000 of their own money to fix the sea wall behind the home, which also protects the town road and other properties. Motyl’s late husband, Gary, was chief investment officer of the Templeton Global Equity Group and president of Templeton Investment Counsel. Not all properties that have repeated severe losses or are second homes are owned by the wealthy. It is these homeowners who have the least wiggle room to pay for the large premium increases arising from the 2012 law and new flood plain maps. Without relief — or help to elevate properties — they have few options, they and some politicians say. It is these homeowners that have sparked most of the call for delay in Washington. Those who own second homes meanwhile, say they are merely availing themselves of a government-promoted program. Doris Privitera’s summer home at 121 Turner Road on the oceanfront in Scituate, on which she pays a government-subsidized insurance rate, is being elevated with a FEMA grant that will pay 90 percent of the cost. She and her husband bought the house 45 years ago. Flood insurance “is controversial,’’ she acknowledged, noting her neighbor had questioned why FEMA was giving her elevation funds until he, too, applied. “Should the taxpayers pay? It’s a difficult thing to say as an owner,” she said, but pointed out that the elevation would save on future payouts. Some coastal experts say incentives need to change to encourage people to leave homes that will continually get hit; perhaps by giving tax breaks for moving, denying insurance after a certain number of losses, or pursuing voluntary buyouts. While FEMA has purchased 20,000 properties since 1993, the buyouts have not been popular among coastal dwellers. Rachel Cleetus, senior climate economist for the Union of Concerned Scientists, a Cambridge-based research and advocacy group, said the flood insurance law the Senate is likely to vote on this week takes important steps to bring insurance premiums in line with the risk of severe repetitive loss properties. She suggested that the addition of a means-tested voucher program — reduced premiums for people with lower incomes — could help soften the financial blow for families that can’t afford a rate increase. The New England Center for Investigative Reporting is a nonprofit investigative reporting newsroom based at Boston University and WGBH TV/radio and supported in part by New England news outlets. NECIR interns Michael Bottari and Amanda Ostuni helped research and prepare this report. Follow Beth Daley on Twitter at @BethBDaley.